While Beijing’s weather these last few weeks has often been spectacularly clear, the general trend still has frequent AQI spikes over 200, thus triggering my personal cutoff to wear a protective mask during my bike commute to work. I’ve blogged many times about air pollution masks and how 3M’s N95 series was (and is) my personal gold-standard, but 3M’s masks remain very non-consumer friendly, designed for construction workers and not consumers. Last year Totobobo came to China, which I generally liked and discussed in my review. Now there’s another new consumer-oriented mask called Vogmask, started by a group in the super-green enclave of Santa Cruz, California. You can read all their company specs here at their website, but the gist is that they claim to have “the world’s first good looking filtering face mask.” They carry two types, with their flagship models made of a high-tech non-woven microfiber which is officially tested to filter 99% of non-oily particles larger than 1 microgram. They also have a series of cotton masks which are supposedly more comfortable in hotter weather but aren’t specifically rated against pollution (the data isn’t finished yet). They have a bunch of different models and styles and sent me a few to check out, so here’s my report. The Alien Factor: I still have serious aesthetic issues with Respro’s Darth Vader-ish bike masks and I know they will never be mass sellers. But Vogmask does very well here, in fact better than any other brand as they have six different styles. I got very few stares with this mask on the Beijing streets — which I take as a good thing. Comfort: The Vogmask definitely gets high marks for being the most ergonomically comfortable mask I’ve tried. Plus, I was happy to find no sharp lines on my face after wearing, which every other mask causes to a certain degree (including the Totobobo plastic). I also far prefer their around-the-ear loops to behind-the-head straps which many other N95 masks have. Does It Work? I think the microfiber masks definitely were doing something: in fact, a few times I struggled to pull in enough air as the filtration was so strong. But most of the time my breathing was fine and I did sense cleaner air. However, I don’t think the seal around it is nearly as tight as Totobobo’s plastic or a good 3M hard mask; so the real-world effectiveness is hard to tell but would be hard to match Totobobo’s 99%. However, there is no fit-testing data available to make true comparisons — yet. Reusablity: Vogmask gets good marks as both of their models can be washed multiple times with no loss of fabric quality. Totobobo also is good that way, as you can pop out and replace their white filters many times. Price: Each mask sells on their website for USD $20, which seems quite reasonable as you can wash multiple times. This is very competitive with Totobobo, which lists ast USD $23-25, not including new filter packs. Bottom Line: I would love to see real world fit-test data on the masks, especially the cotton ones, as I’m sure the actual filtration isn’t 99% as some air comes around the edges. 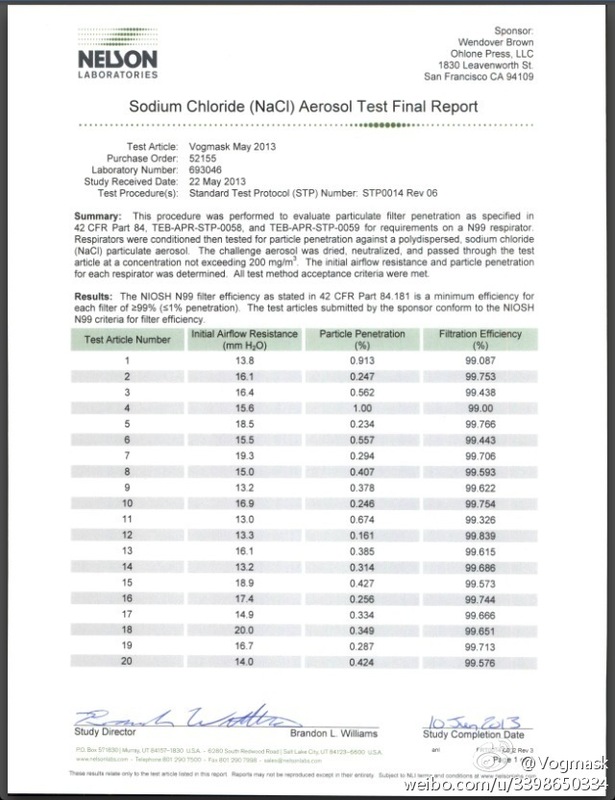 Totobobo does have this data and proved over 99% filtration. But Vogmask definitely is extremely comfortable and has a wide selection of patterns, so I think many consumers could appreciate these. These would also double in the winter as face-warming kouzhao 口罩 with far better air pollution protection than the usual regular cotton. Hi can we buy them in BJ or if we order in the US of A will there be a customs fee? I believe that the Torana Air stores carry them in Beijing. I am not sure — you should check out their main website and email them. Hello Dr.Richard Saint Cyr, my name is Michael. I currently work for a U.S based company from Minnesota. We also produce a Sport Dust Mask called the RZ MASK. We currently have 30+ designs which come in 4 sizes and one of them being a childs size! We are experiencing great growth and would be interested in you testing our mask as well! We are eager to expand into the pollution industry as we know how pollution has its affects on the body! Vogmask found a reseller in SHanghai which is currently working on a taobao shop. am eager to get my hands on some too but in the meantime, there some 3m Nexcare 8550 thinsulate masks on taobao…. Great Article! Really helped me a lot in regards to my decision! Hello, really appreciate the information on your site. Wondering whether you are familiar with this “lvzhi pm2.5 mask” http://www.pm25mask.com/, which is available at amazon.cn and other places? Would appreciate your views on it. My Chinese is not that great, but they appear to list many testing results on their amazon page (http://www.amazon.cn/gp/product/B008U4RYX4/ref=oh_details_o00_s00_i00), and have from large size down to XS for 3-6 year olds. Yes, I just bought one of their masks last week at 7-11! Honestly I was not impressed with the fit around my face, and air easily escaped all around the sites, so clearly effectiveness is diminished. Their insert is indeed rated 99% effective — but it’s a smallish patch and not the whole mask. I would much rather see real world fit-testing results on a real face. We have those results from Totobobo, for example, and results are impressive. And of course, any 3M N95 mask is still the gold standard. Thanks for all the detailed technical advice – love your website! Traveling to China soon w/two kids (9 & 11) what is the best mask to purchase and what SIZE for kids? Respero Aero Small size or Totobobo (and which SIZE of the Totobobo?). How many filter replacements do you recommend per week for a mask? Many thanks in advance for your help. That’s a tough call! I prefer Totobobo because it looks much more normal than Respro. You custom cut them to size… There’s no consensus on this.. What do other parents say? Think you would be interested in this. I want to report an ongoing concern on Vogmask flagship shop on Taobao as of December 14th. I read your blog and went and spent a hefty sum of 810kuai for their masks right after I chatted with the support personnel who said they were ready to ship the inventory. That was on the 7th, and they still have not gotten back to me after my numerous “pokings” (there’s a link that sends a reminder to ship an invoice) and chat inquiries. The website has a 100% favorable feedback rate so I am assuming this is some hitch, but after a week I ended up canceling the order and am currently waiting for the money to return to my Visa Card. That’s scary, my Chinese is really not that good. I’m sorry with your problem with them. You could always send emails to their customer service to discuss this, here http://vogmask.cn/index.php/contact/ . I know the team well, both in China and in USA and they’re quite professional. By the way, my Chinese also isn’t good and Taobao QQ chats are impossible for me, and hard to find sometimes. A couple of times I’ve gotten responses but never knew, no message goes to your email or SMS telling you there’s a message waiting. They probably are understaffed and decided to priortize wholeselling rather than the online retail. I guess I am happy for them that their sales are boosting but definitely not happy for myself! Here in Qingdao the best we can do offline this year is to buy the 绿盾PM2.5口罩, they are sold for 32 kuai in many places this year which alone is a huge improvement over last year when none were in sight. They have children’s sizes and refills are also easy to purchase. I realize that they leak a lot but am hoping that in a lesser polluted area like ours if they cut PM2.5 intake to half on the worst days maybe that would be difference enough…. We’ll continue to keep reading your blogs for further insights. Thanks again and happy holidays! I personally think the 绿盾PM2.5口罩 is a terrible choice! Why wouldn’t you just buy 3M masks? You can buy them all over the internet, especially from Amazon (z.cn). They are far superior to 绿盾PM2.5口罩. Clearly that mask has so much leaking that there’s no way it’s properly getting 95%. I emailed them multiple times asking to see their fit test reports but they never emailed me back. If they have a fit test result which shows 95% effectiveness, then maybe I would add them to my list of masks to use — but right now I defintely would not recommend them. They did email me the test results for the actual filter, and yes that worked very well — but as I’ve repeatedly said, who cares if the filter works well if the mask doesn’t fit your face and air leaks! Thanks for your input. I understand. But my child does not like wearing the 3M at all. I don’t want her bullied at school for using Totobobo, she goes to a regular Chinese school, not a fancy international school where everyone reads your blog. I use the I can breathe and it also feels somewhat leaky and loose, but somewhat better than not wearing at all. We do have 3M adult sizes at home, but she declined to use them after a couple of tries. As I said, Qingdao is not as bad as Beijing. She says the local mask seems to block some stinkiness, so while I know that 95% blocking is a far cry, I ask her to use them on those rare days when Qingdao hits above 200 again hoping to block some particles, obviously not all. Unfortunately we just don’t have the same choices out here. Maybe next season Vogmask will stoop to service us online. I will consider if I forgive them next season if they do.